This week, the Santa Cruz Weekly's cover story is about my museum (the Santa Cruz Museum of Art & History) and the work we have done to make it a more participatory, community-centered place over the past two years. The article captures a lot about our approach, from prototyping to perpetual beta to working with artists to developing successful frameworks for diverse visitors to participate. The author, Georgia Perry, talks about her own participatory reticence and how our programming invited her into active engagement in a safe and exciting way. Perry describes me as the "conductor" of a community-programmed orchestra. I love this image--not controlling everything, just helping steer the way and keep us moving forward. I feel really lucky and grateful to live in a community that is so supportive of and engaged in experimentation in museums. Let me know what you think of the article either here or on the Weekly's site. Enjoy! The three years I spent as the girlfriend of a stand up comedian taught me one very important lesson: You do not, under any circumstances, sit in the front row. I learned my lesson early on, after a knockoff Adam Sandler-type at a chintzy Long Island club spent three of his allotted five minutes commenting on the simple fact that I was eating a sandwich. Because of Nina Simon.And yet, if all of what I described above is true—which it is—why then, did I leave the Museum of Art and History (the MAH) in downtown Santa Cruz on a recent Friday evening having (a) willingly contributed to a chalk-written poem on a staircase, (b) posed jauntily for a photograph intended for public display on the museum’s website while (c) holding up a colorful tissue-paper collage I made at some sort of wax art station, standing shoulder to shoulder with a half-dozen strangers? While arts attendance is dwindling across the country, there is one place where Americans still are participating—the Internet. About 1 billion people use Facebook. YouTube has 800 million users. By contrast, the National Endowment for the Arts found that only 51 million people went to an art museum in the U.S. in 2008 (the most recent year for which they have data). But here in Santa Cruz, Simon is convinced that the two worlds can be merged. 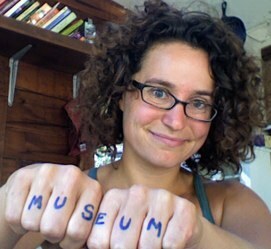 In her book, The Participatory Museum, Simon references a study by Forrester Research, which found that online audiences participate in five different ways. There are “creators” who produce content, “critics” who rate and review, “collectors” who organize and aggregate links, “joiners” who maintain accounts on sites like Facebook, and “spectators” who read blogs and watch YouTube videos. It is no surprise that there are far more “spectators,” “joiners” and “critics” than there are “creators.” Not everyone wants to be front and center, and thankfully that’s not the only way to participate. With an understanding of what works on the web, Simon has refocused the goals of the MAH and turned it into a warm, interactive place. The success of the museum since she became executive director in May 2011 is staggering. Attendance more than doubled in her first year, rocketing from 17,349 up to 37,361 visitors. Lacking an art history background, Simon instead studied engineering and math in college. She began her career at NASA, engineering prototypes for remote sensing of the Earth’s surface. In her spare time she volunteered at a science museum, doing electronics workshops and puppet shows about math. She eventually left the lucrative job at NASA to pursue museum work full time—a scary decision, especially considering her first museum job after NASA paid seven dollars an hour, and Simon was indeed scared. But she didn’t let that stop her. Her engineering brain stayed with her through the career change, and today she successfully uses the tools of prototyping, data-driven experimentation and what she calls “the engineering design cycle” to get back-of-the-room people like me to participate at her museum. And participate they do. People are so involved at the MAH that Executive Director of the Santa Cruz Downtown Association Chip says that audiences not only participate at the museum, they create it. “Nina has been brilliant in that she’s not programming [the museum]. She’s got an amazing staff, and they’re not programming it either. The community is programming the museum,” he says. If Santa Cruz is orchestrating the MAH, it’s safe to say that Simon is the conductor. In an afternoon spent at the museum with her—the careful engineering quietly influencing each participatory exercise, each community member contribution—this becomes clearer and clearer. In her office, which features an entire wall covered in comment cards from the MAH’s visitors, she pulls a blue Post-It note off her computer monitor. “Kept her sweatshirt forever,” it reads. A museum attendee wrote that as a contribution to part of an exhibition called “Love Gone Wrong” in spring of 2012. The staff at the MAH painted a broken heart on the wall with a prompt that said, “After the breakup I…” They left a bunch of Post-Its and pencils and let people finish the sentence. After the breakup I kept her sweatshirt forever. But the appearance of that poetic Post-It wasn’t just dumb luck. At a staff meeting prior to the event, she and her staff each wrote a question related to breakups on a piece of paper. Then they passed the papers around and answered each other’s questions. “Everyone’s an artist until they stop being one,” he adds. On our way out of Campbell’s gallery she points out an arrangement of three couches and a coffee table in the hallway, saying there used to be a “scary desk” there instead. “A traditional museum approaches exhibits by saying, ‘We’ll design it. We’ll build it. We’ll open it. And then we’ll see at that point if it works.’ That’s not what we do. We say, ‘Let’s figure out a prototype we can make with just cardboard and some printouts, and let’s take it out onto the floor with visitors to test.’ We’re really comfortable bringing out things that are unfinished and not worrying that everything has to be perfect,” Simon says. The MAH wasn’t always this way, though. Before she came on board, Simon says the museum “was seen as a cold place. It was seen as a place where not a lot was happening. It was seen as a stuffy place. It was seen as a traditional place.” The museum’s board decided they wanted to cultivate more of a welcoming environment for the community to gather and participate. Simon, who was doing consulting at museums across the globe, was the right woman for the job. Hiring Simon was “a really big moment for the museum and community in terms of the role of museums,” says the Downtown Association’s Chip. 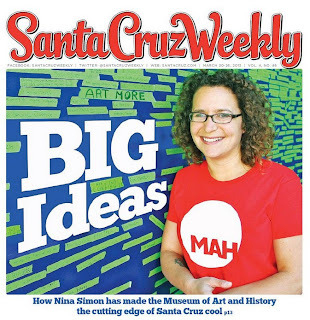 He calls what she did at the MAH “revolutionary,” and has been pleased to see how the museum’s makeover impacted Santa Cruz’s monthly First Friday events. “When Nina came on board, right away they were open for First Fridays. They started stepping up and really participating and being active…The museum has played a huge role in First Friday’s growth. A lot of people have the idea, ‘It’s First Friday, let’s go start at the museum, and then we can fan out from there to all over town.’ There’s a certain gravity that has been really valuable to First Friday,” he says. First Friday night events are by far the MAH’s most popular, generally drawing crowds of close to 2,000. Regular weekday attendance is rarely more than eight or ten people. In addition, the MAH holds themed Third Friday events and is open late on second and fourth Fridays, too. Third Fridays are organized by the museum’s Director of Community Programs, Stacey Marie Garcia, and usually bring in between 300 and 500 visitors. For every Third Friday event, Garcia works with anywhere from 30 to 150 different organizations that come together to create themed events with dozens of stations for people to participate. Because of the MAH’s growing reputation as a hub for the community, more and more artists and organizations are coming to the MAH, asking how they can get involved in producing a Friday night event. “Last year we had a woman named Anna Pollack come in and say that there’s this issue about the bee population depleting and she would love to raise awareness about that. So she worked with us to design this entire event around the idea. We showed the bee film, we had bee keepers come in—they stayed in a case, so it was good—we did some activities with encaustics using wax,” Garcia says. Garcia met Simon while in art history graduate school in Sweden. Simon came to lecture the same day she got the job at the MAH. Garcia immediately asked if she needed an intern, and followed her to Santa Cruz. She has since been hired full time. “I came because I knew [Simon] is doing innovative things in the museum world right now and making huge steps. I wanted to learn from that,” she says. The biggest risk they’ve taken, says Garcia, was last spring’s Glow/Fire Festival. Burning Man artists approached the MAH about doing a fire festival. “Go for it,” said Simon, and Garcia set about coordinating with the city, the fire department and, of course, the artists to ensure the event was a success. It was, and they have another one planned for October 2013. Garcia has been consistently impressed by the community’s contributions, dedicating time to participate in and organize events. Article reposted with permission from Santa Cruz Weekly.